On February 9th we released NMAlerts, the enforcement activity app featured in the Winter 2017 issue of Driving Freedoms – the one with the Wizard of Oz meme on the cover. NMAlerts is a new benefit available only to supporting members of the NMA. We have had a lot of fun beta-testing the new app and now are excited about making it available to the NMA community. NMAlerts is powered by data from three sources: Speedtrap.org, Roadblock.org and SCDB.info. We have to give a shout out to NMA Board Member Eric Berg for finding the German database that identifies red-light and speed cameras locations around the world. We contacted the proprietors of SCDB.info and they were more than pleased to offer a free licensing agreement that allows the NMA to regularly update the U.S. and Canada ticket camera information in NMAlerts. The ability to locate photo enforcement operations helps to round out the range of police activities spotlighted by the NMA app. All three data sources have something in common: The enforcement activity information is based on historical reporting from motorists. The frequency with which fellow drivers report a specific speed trap, roadblock or ticket camera location is a great indicator of the likelihood that the police will continue to stake out that spot, returning to the scene of the crime so to speak. 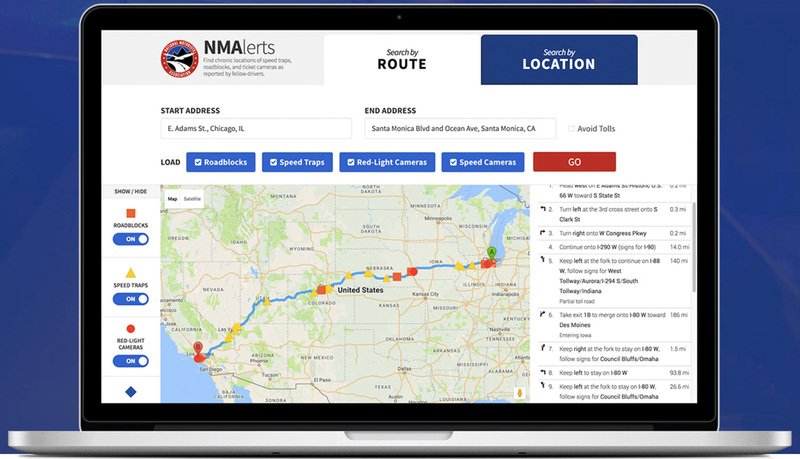 While apps like Waze provide near-real-time warnings, NMAlerts goes a different route by sharing information from other drivers about police behavior at specific locations – how and where they are positioned, and other tactics typically employed. That is the type of knowledge that can help you avoid needless tickets.